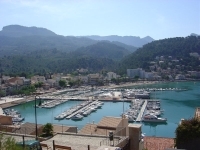 Soller, set in a lush valley of orange groves between the mountains and the sea, half way along the northwest coast of the island, is a popular day trip destination because it can be reached on a vintage train ride from Palma. The train, a wood-panelled 1912 model, takes passengers winding through the beautiful craggy landscapes and into the Golden Valley where Soller is situated. The town is awash with tempting pastry shops, ice-cream parlours and tapas bars in its quaint squares, but there is more to do than just eat and drink. There are some good examples of modernist architecture, like the church of Saint Bartomeu with its 1912 arched tower above a rose window, and needle-like spires. There are also two museums: the Natural Science Museum displaying fossils, and the Museu Municipal filled with antiques. There is a vintage tram running between the town and the port (Port de Soller). Life is slow in Soller, which seems perpetually scented with citrus. It is an ancient town, with evidence that the area was inhabited by humans as early as 5200 BC, but rather than big tourist attractions visitors will find buckets of charm and many good reasons to just relax and enjoy the atmosphere.